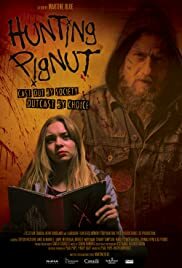 HUNTING PIGNUT can be considered a true female project (from Newfoundland, Canada) with a female writer and director Martine Blue and two strong female protagonists. It is also Blue’s first feature and an autobiographical one at that. It is therefore not surprising that the film won Best First Feature at the Arizona International Film Festival and Best Canadian Feature at the Female Eye Film Festival. The story centres on 15-year-old Bernice Kilfoy (rising star Taylor Hickson, fresh from her debut DEADPOOL). She hates her life in tiny, isolated Black Gut, Newfoundland. She believes that she will never live down a traumatic childhood that left her body and psyche deeply scarred. Bean (Amelia Manuel), her mother, tries to be a friend but is too busy struggling to get ahead. 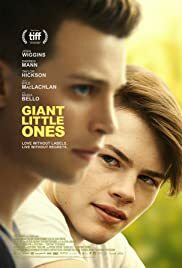 Self-centred, lonely, starved for attention and shunned by her peers, Bernice, who is bullied and constantly being beaten up, makes up stories about hanging out with her dad, of whom she hasn’t seen in 10 years. Her dejected spirit takes a strange turn when her dad dies of a heroin overdose and Pignut (Joel Thomas Hynes), a nihilistic gutter punk, shows up for his wake. The death and funeral service occurs at the start of the film. The service is crashed by Pignuts punk friends who are thrown out of the funeral hall. It is discovered that they have stolen the father’s ashes. Bernice stumbles upon Pignut’s writing journal and becomes obsessed with discovering more about her father, his mysterious facial tattoo, his best friend Pignut and their clan of nomadic gutter punks. Bernice embarks on an odyssey to hunt down her father’s ashes and to discover her place in his heart and in the world. The best thing of the film is the depiction of the punk gutter scene. Director Blue drew on her previous experiences when she herself was in this scene. These people, squatted, panhandled and ate food from garbage dumpsters. Bernice is shown in the film as a rebel who dives into the group, which initially rejects her due to her age. The trouble with the film is that the story is not credible and filled with too may coincidences. The mother, Bean is genuinely trying to make an effort to connect with her daughter and it is hard to believe that Bernice still shuns her. When Bean travels to the city to find Bernice, she finds her out of the blue in a building doing drugs. The chances of this happening is close to negligible. In another scene after Bernice is beaten up by a punk ember, the cops happen to be right there. At least Hickson and Manuel deliver winning performances as daughter and mother. Comedienne Mary Walsh, who happens to be appearing in anything Newfoundland has a cameo in the film. Despite the film’s well intentions, like attempting to show love within the punk group, the film fails from its careless writing. The film benefits from a strong female presence but HUNTING PIGNUT deserves much better.